Atlanta is home to some spectacular places to ride a bike, and while some have been hidden gems the word is getting out. 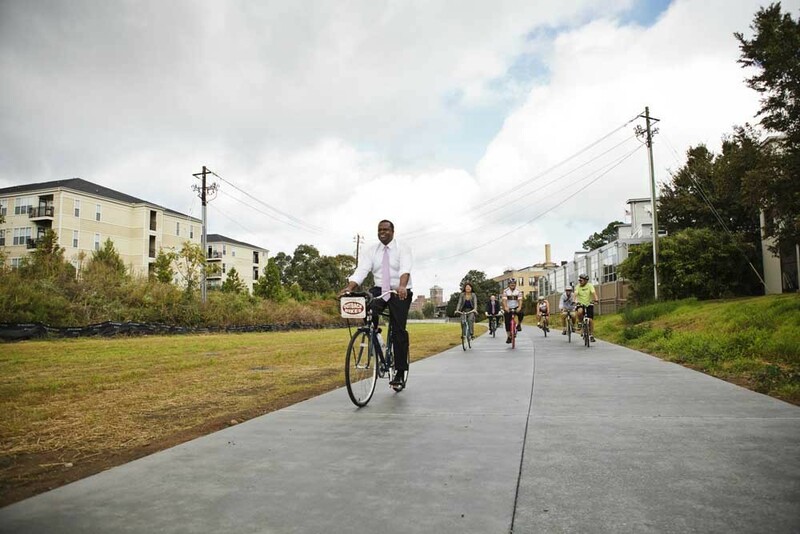 Chances are good that you have heard about the Atlanta Beltline, one of the largest urban infrastructure projects in the nation and which will feature (upon completion) 33 miles of multi-use trails, and connect other regional trail networks together as well. Existing segments include the Eastside trail (pictured at left), the Southwest trail, the Northside trail, and the Westside trail. 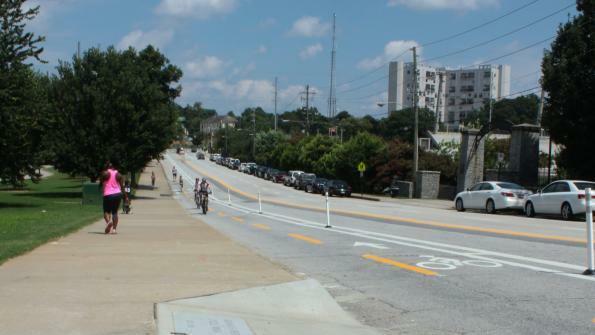 The Beltline is among a number of great multi-use path spaces that offer a chance to ride comfortably and leisurely without sharing space with cars. Other great trail places in the region include the Silver Comet Trail, Arabia Mountain Trail, the Stone Mountain Trail, the Path 400 Greenway, the Noonday Creek Trail and the Big Creek Greenway. Trails and paths offer a wonderfully comfortable experience, but they're not the only high quality infrastructure around. The City of Atlanta is home to a number of protected bike lanes on 10th St in Midtown, and John Portman, and Peachtree Center in Downtown. Bike lanes are also common in neighborhoods across the metro area, and you can identify corridors with dedicated facilities using Google Maps' bicycle route feature. Want something closer to home? Consider what's right out your front door! Often small residential streets offer low traffic speeds and limited motor vehicle traffic, making them great places to get in a short ride or to use as connections to get to a nearby destination. They're not always direct, but that's perfect - you'll have the roads to yourself! This mix of facility types in the region affords excellent cycling opportunities for all experience levels and trip types, whether you are commuting to work, running to the store, hitting the town on the weekend, or getting some exercise and fresh air. The Silver Comet Trail is a 61.5 mile long non-motorized, multi-use, paved trail that is located 12 miles northwest of Atlanta. This is a relatively quiet trail, often running through wooded areas, that starts at the Mavell Road Trailhead in Smyrna, although there are a number of trailheads offering parking, bathrooms, and water fountains. The Stone Mountain Trail is a nineteen mile-long trail that requires a limited amount of on-street travel, with the majority of the route being located on paths running parallel to a roadway. The trail connects downtown Atlanta to the King Historic site, the Carter Center, Fernbank History Center, downtown Decatur, Stone Mountain Village, and Stone Mountain Park. There are also many group rides put on by various organizations and bike shops throughout the year. These rides run the gamut in terms of difficulty (beginner to advanced) and geography (Atlanta city center to the suburban areas of the Atlanta region). You can check out these rides and hook-up with groups through the Southeastern Cycling website. Check out the Mobile Social, a monthly social ride that travels around a different part of the city each month, always ending at a favorite local bar or restaurant. It's a fantastic social event, with great people, comfortable routes, and an atmosphere that perfectly combines a beautiful evening bike ride with a relaxed happy hour. If you haven't been before, it's a must! Relay Bike Share has rolled out in Atlanta and has 500 bikes and more than 70 stations across the city. It's a quick and easy way to access a bike for transportation or recreation, and their technology makes it easy to find a bike, park it at your destination, and then return it when you're done with your ride (or have them pick it up at your destination for a small charge). You can also find their stations just by looking for the gorgeous blue bike share bikes! 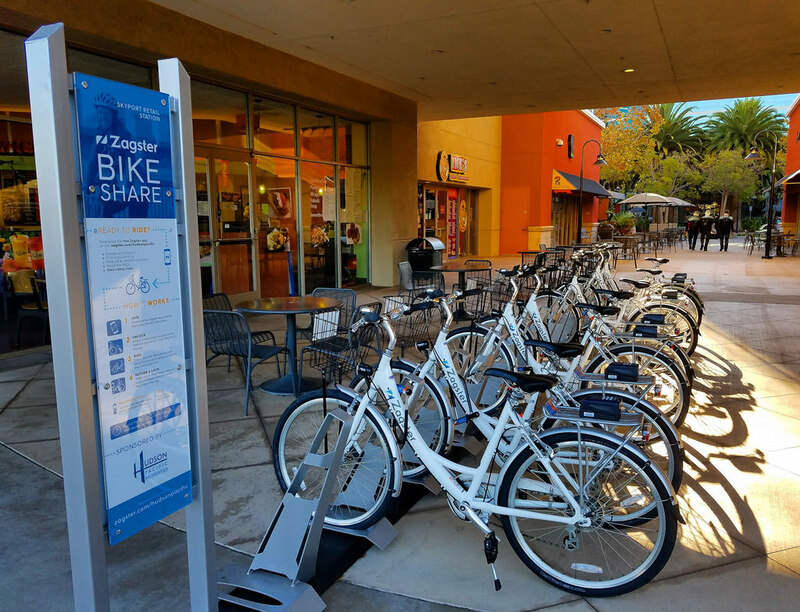 Zagster is the primary Bike Share in Kennesaw and operates in more than 200 programs in 35 states. Download the app and create an account to begin. When you want to ride you can use the app to find and rent bikes or you can look out for bike docks when you're in the city. Make sure you return the bike to a dock when you've finished riding. Interested in cycling on the Atlanta Beltline, through Piedmont Park, or around Downtown and Midtown Atlanta? Try: Relay Bike Share, Civil Bikes (who also offer fantastic tours of historic Atlanta), or Bicycle Tours of Atlanta. If you want to ride on the Sliver Comet Trail but need a set of wheels, you can rent a bike through Smyrna Bikes. Additionally, you can contact Cycleworks for bike rentals near the Big Creek Greenway and downtown Roswell, Aztec Cycles for exploring the Stone Mountain area and its surrounding trails, or Free-Flite Bicycles if you are in Marietta.